My head still continues to have problems comprehending just how wide 16:9 screens are. I'm sure that monitors will gradually evolve to the point where they're just a single pixel high and 20,000 pixels wide. Iiyama's latest – the ProLite B2409HDS – is a 16:9 letterbox beastie, and I've had to move some of the crap on my desk just to fit it on. 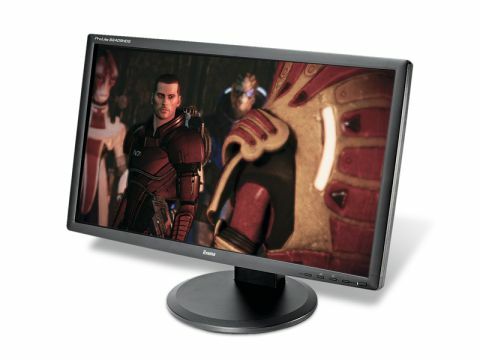 Compared to other monitors it's rather pricey for a 24-incher. It doesn't feature LED backlighting, or an IPS panel, instead it relies on conventional backlighting and a cheapo TN (Twisted Nematic) panel. It does boast of a 20,000:1 contrast ratio and 2ms response time, but as we've found, these particular numbers don't actually mean all that much in the grand scheme of things. In fact, when compared to the 22-inch Dell E207 I've been using for the past few months in the office, the display is far poorer. Colours looked washed-out and, and there was some smearing on the screen in our response time tests. 2ms? Yeah, right. The viewing angle was quite appalling, too. Blacks were impressive, though, and it does come with the HD 1,920 x 1,080 resolution. There are a couple of nice features on the Iiyama though. It's got a fairly thin bezel, so you can multi-monitor your PC, if you've got a desk the size of the state of Montana that is. And if you want to, you can rotate the whole thing 90° as well. I've just stopped to try this, and it looks utterly absurd, like you've got a Windows 7-powered monolith from 2001: A Space Odyssey on your desk. Good for Tetris and bank statements, not for a lot else. Iiyama have, unfortunately, truly priced themselves out of the market with this particular monitor. If it were priced at around £150, it would be a must-have, but at this price you can pick up a stunning IPS panel - albeit in a 22-inch form factor. Hopefully Iiyama will see some sense and drop the price, but you're better off sticking to the 24-inch AOC 2434PW or the 22-inch Benq G2200HD.